This U.S. congressman was born on February 9, 1804, at Queensdale, N.C. After being admitted to the bar in 1828, he established a law office on this corner in Bennettsville. 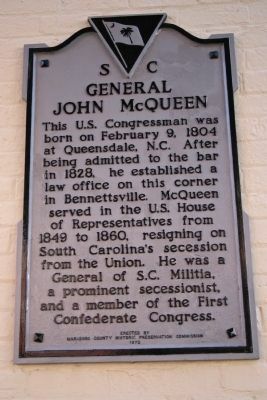 McQueen served in the U.S. House of Representatives from 1849 to 1860, resigning on South Carolina's secession from the Union. He was a General of S.C. Militia, a prominent secessionist, and a member of the First Confederate Congress. Location. 34° 37.007′ N, 79° 41.02′ W. Marker is in Bennettsville, South Carolina, in Marlboro County. Marker is at the intersection of S. Marlboro St. and E, Main Street on S. Marlboro St.. Touch for map. Marker is on the side of the McColl Building. Marker is in this post office area: Bennettsville SC 29512, United States of America. Touch for directions. Other nearby markers. At least 8 other markers are within walking distance of this marker. Confederate Civil War Monument (within shouting distance of this marker); Bennettsville (within shouting distance of this marker); Marlborough County Court House (about 300 feet away, measured in a direct line); Jennings-Brown House (about 300 feet away); Old Female Academy (about 300 feet away); J.F. Kinney House / P.M. Kinney House (about 400 feet away); Bennettsville Presbyterian Church (about 500 feet away); Murchison School (approx. 0.2 miles away). Touch for a list and map of all markers in Bennettsville. More. Search the internet for General John McQueen. Credits. This page was last revised on June 16, 2016. This page originally submitted on November 16, 2010, by David Bullard of Seneca, South Carolina. This page has been viewed 552 times since then and 9 times this year. Photo 1. submitted on November 16, 2010, by David Bullard of Seneca, South Carolina. • Bill Pfingsten was the editor who published this page.